I've seen countless DIY coat hanger tutorials on the Internet, but most I've seen call for wire hangers or all-over plastic ones that are ugly to start with and look great after a revamp. My set of coat hangers are pretty nice to start with. 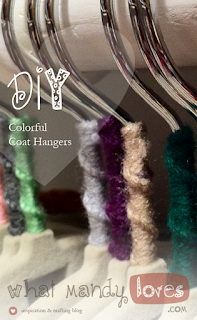 They're the thin, space-saving, fuzzy-textured, fancy-colored hangers you'd find at a bath and body store. When all hung up together they appear to stand at attention like a line of soldiers defending my clothes from gravity. These hangers needed something fun to balance out the stoic soldiers and the clothes they hold. That's where this DIY coat hanger tutorial came in. Around the time I purchased these hangers, I had been in a friendship-bracelet-making FRENZY and had just found tutorials on how to wrap chords with yarn or embroidery floss. This new obsession sparked an idea. What if I use the same knotting technique from these chord wrapping tutorials for the neck of my hangers? 1. Cut a long piece of thread. I measured the length of my arm from wrist to shoulder for the neck of my hanger but I did not use all of it. Make sure its enough to work with in the length of the hanger you wish to decorate (i.e the neck of the hanger up to covering the entire hanger). If you run out before you're done, it's easy to add more thread to it. 2. Tie the thread to the base of the hanger or wherever you wish the thread-wrapping to start on your hanger. If you're wrapping the entire hanger, I'd start at the base of the neck where the "arms" of the hanger begin (the triangle part of the hanger, I mean). Make sure the knot is secure. 4. Use your needle with the extra thread to tuck in the end piece into the wrapping. Cut off the excess thread. I'm loving how these guys look. The soldiers have colorful identities now, holding my clothes up fabulously. 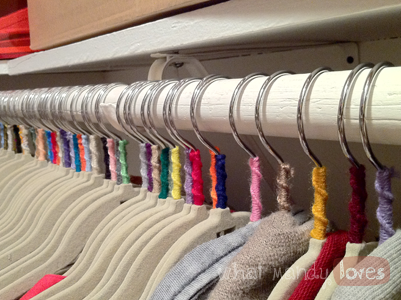 I made sure to use as many different colors as possible for each hanger. Also, I like to place them on the rod so all non-chronological color near another. (Creating a rainbow and keeping it that way is more of a headache for this perfectionist.) Sometimes I'll switch hangers of clothes down the line to make sure no two similar colors are next to each other. How have you fancied up your coat hangers? Are there any other wrapping techniques you wanna share with us? Let me know in the comments!